The exterior of the new super-efficient Microsoft data center in Dublin, Ireland (click for larger version). Like this story? Get the latest data center news by e-mail or RSS, or follow us on Twitter or Facebook. 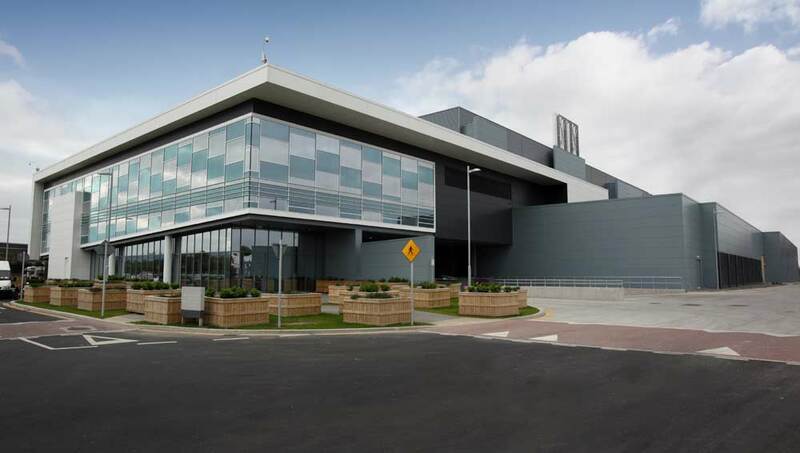 Microsoft's new data center in Dublin represents a milestone in data center design. The new facility will power much of Microsoft's global cloud computing operation, while using far less energy and water than typically consumed in other data centers of this scale. The Dublin center operates at a Power Usage Effectiveness (PUE) of 1.25, Microsoft says, compared to averages of about 2.0 for the industry and 1.6 for other Microsoft facilities. This photo gallery offers a look inside the new Dublin facility, offering a closer look at the design innovations driving its efficiency, including a "free cooling" system that uses outside air to cool the data center, and a server pod design that employs hot aisle containment to support warmer operating temperatures inside the server space.